spend thousands in research using the latest technology and this can be seen thru our wide variety of apparatuses, ease of use, and functionality yet allowing the flexibil ity to do advanced research. Our (BCX Ultra) approach to our unit designs is to use Royal Rife's technology and build/add on taking advantage of the advancements in the latest technology. If Royal Rife was alive today we believe his rife devices would not look like 1930's or 1950's technology but would have advanced along with newer technologies. Other's philosophy is to mimic as close to possible Royal Rife's technology. A perfect example is with digital technology we are now able to use different wave types to deliver frequencies. Square waves, commonly used in modern devices, could not be produced by the older equipment. The BCX Ultra rife machine uses RF carrier wave to piggy back or carry the audio frequency deeper in to the body. The BCX Ultra gives you the flexibility to change any settings for research and testing. The BCX Ultra uses both delivery methods induction conduction. A fundamental difference between the BCX Ultra and most other Rife type devices is the way that we generate waveforms. HELD RAYTUBES vs. METAL ACCESS. 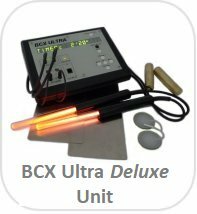 The BCX Ultra uses both methods (induction & conduction) developed by Dr. Rife and his two business partners, John Crane and John Marsh. The Induction method is the method where frequencies are delivered into the body using the "Induction" non-contact method via plasma ray beam tubes. 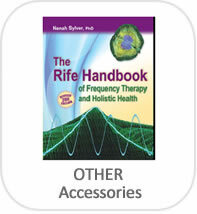 Royal Rife developed this method which delivers a broad spectrum of energies. These energies range from visible light spectrum, conductive electron flow, electromagnetic fields, to electrostatic fields and more. "Bioelectrical Impedance Analysis" tests show proof that the rife frequencies do penetrate the body. The Conduction method is the direct-contact method of delivering frequencies through the body using electrical (a positive and a negative polarity) via the metal electrodes which was used by John Crane and John Marsh. The 'Bioelectrical Impedance Analysis" tests also show frequencies delivered do pass through the skin and penetrate into the body. There drawback to using this method is the level of penetration which is overcome by using an RF radio carrier frequency. However if you use an RF radio carrier frequency the low audio frequencies will also penetrate the cells. 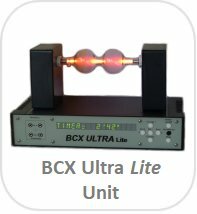 For this reason the BCX Ultra has a carrier wave that can be set from 1hz to 4 Mhz (electrodes/BT-HFPCM2 beam tube) and up to 100,000 Hz for the hand-held plasma tubes. There is some confusion out there about how the BCX Ultra carries frequencies through the body. BCX Ultra Hand-held Raytubes use Conduction, Induction, and Radiation, however, the main method is Conduction. 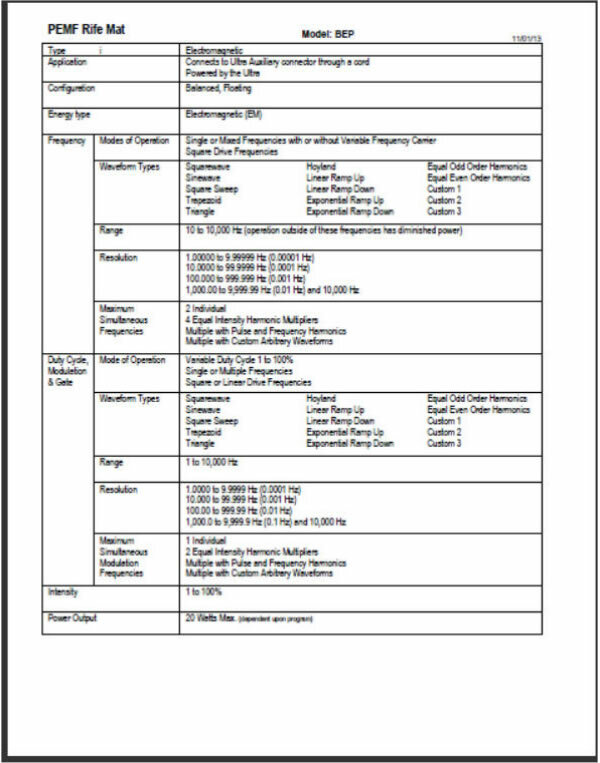 Here are some simple tests that a lay person can observe and perform to prove that we do use the conduction method. 1. Lay both tubes next to each other about 4" apart and notice that the tubes glow dimly. They glow dimly because there is a little conduction through the air. Now, hold both tubes, one in each hand, and notice how bright they become. This is because you are now completing the circuit through your body allowing the full power of the ray tube circuit to flow through the tubes and then through you. 2. Touch the tubes and you will notice that the light gets brighter where you touch the glass. This indicates that current is exiting the tube and into your finger touching the tube. Note: Our stand alone beam tube units do not show much of this phenomenon because they are using mostly the induction and radiation methods. 3. This is a fun experiment. Especially, if your partner isn't aware of the result. Both you and your partner hold one of the ray tubes in your outside hand as you stand next to each other. With your inside hands let your hands droop down, palm facing down. Next, touch the top side of your wrists together and notice the pronounced shock you get as you complete the circuit. If you look closely while doing this you will see sparks. This test is only for those that need a very strong sensual persuasion to understand simple principles of ray tube operation. Now, you are wondering how electricity goes through glass. Wikipedia. says this. "The glass acts as a dielectric in a capacitor formed between the ionized gas and the hand." Most of energy of Raytubes is transmitted by Conduction, which is why you hold them. Yes, glass is an insulator, but at high frequencies, electricity passes through it because it's dielectric characteristics change. It is NOT a direct current (DC) conductor, but it IS an alternating current (AC) conductor as the simple tests above prove. A fundamental difference between the BCX Ultra and other comparable top rife devices is the way they generate waveforms. They will use a DSP (digital synthesizing processor) which, by nature, is only capable of generating digital Squarewaves. By using filtering techniques, the circuit is capable of approximating a Sinewave by 'rounding off' the Squarewave. The BCX Ultra uses entirely different electronics. It contains 3 separate Microprocessors each of which creates an 'Arbitrary Waveform'. Arbitrary Waveforms are exact and pure creations of naturally occurring and incidentally occurring waveforms. Examples of naturally occurring waveforms are Sine, Square, Triangle, Exponential, and Linear. An example of an incidentally occurring waveform is the Hoyland Waveform. The BCX Ultra faithfully reproduces the waveform that Hoyland generated using a complex array of apparatus. If fact, the Hoyland Waveform in the Ultra was created by digitizing an actual copy of Hoyland's test data. Another example of Arbitrary Waveforms are the Ultra's Odd Order Harmonic and Even Order Harmonics waveforms. The Odd Order Harmonic Waveform produces a fundamental, and the 3'rd, 5'th, and 7'th harmonics is perfect harmonic proportion. The Even Order Harmonic Waveform produces a fundamental, and the 2'nd, 4'th, and 6'th harmonics in perfect harmonic proportion. The BCX Ultra uses entirely different electronics. It contains 3 separate Microprocessors each of which creates an 'Arbitrary Waveform'. Arbitrary Waveforms are exact and pure creations of naturally occurring and incidentally occurring waveforms. Examples of naturally occurring waveforms are Sine, Square, Triangle, Exponential, and Linear. An example of an incidentally occurring waveform is the Hoyland Waveform. The BCX Ultra faithfully reproduces the waveform that Hoyland generated using a complex array of apparatus. If fact, the Hoyland Waveform in the Ultra was created by digitizing an actual copy of Hoyland's test data. Another example of Arbitrary Waveforms are the Ultra's Odd Order Harmonic and Even Order Harmonics waveforms. The Odd Order Harmonic Waveform produces a fundamental, and the 3'rd, 5'th, and 7'th harmonics is perfect harmonic proportion. The Even Order Harmonic Waveform produces a fundamental, and the 2'nd, 4'th, and 6'th harmonics in perfect harmonic proportion. We are the only manufacturer that has a Square Pulse Width Wave (a modified square wave) which we found over time better results than a standard Square Wave. Square Pulse Width is a modified Square Wave that starts from zero and goes to 100% in about 2 seconds. The Square Pulse Width Wave builds up a charge that explodes and kills off more microbes than the standard Square Wave. Square Wave is included with the BCX Ultra however the preferred default wave type for killing off organisms is Square Pulse Width. An exciting range of Wave Forms: BCX Ultra wave forms include square, sine, pulsating square, triangle & many more wave types for research. Square waves are used for killing pathogens sine waves for regeneration/healing. 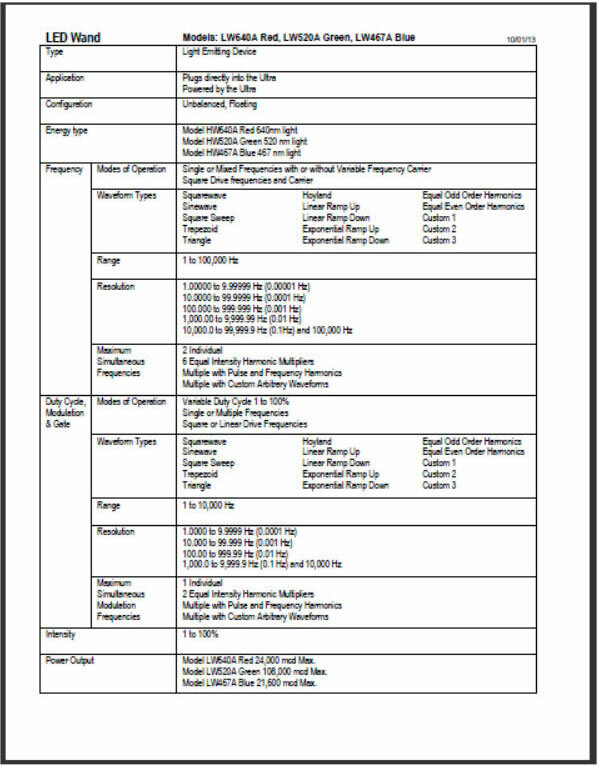 The BCX Ultra has many other wave forms to choose from for experimentation (refer below) which are not offered by other manufacturers. Dr. Royal Rife stated that if the more spikes in a frequency the more lethal to kill the virus. These resonant peaks of the frequency there is an increase in the voltage can break down the cells of the virus wall The more spikes in a wave & less time on, the less chance the organism can adapt to the frequency. Dr. Rife stated, "Now the spikes that you see on the frequencies are the lethal part that kill and devitalize the virus. They are the resonant peaks of the frequencies which increase the voltage to a very high potential which the cells of the virus wall can not tolerate and they break up into many pieces and are destroyed." This statement is according to John Crane business partner of Dr. Royal Rife. The more spikes and less dwell time the less chance of microbes to adjust. See more about BCX Ultra Custom Wave Forms below. - Save and Edit up to 255 Sweep Programs Sweep Up starts at the Lowest frequency, and increases the frequency by the Step frequency for the duration of the Dwell seconds, repeating until the Highest frequency is reached. Then it begins again at the Lowest frequency repeating continually for the length of the Ultra's program time (up to 2 hours). Sweep Down starts at the Highest frequency, decreasing and repeating in the same fashion. Sweep Up/Down starts at the Lowest frequency, increases to the Highest frequency, decreases to the Lowest frequency, increases to the Highest frequency, over and over. Dwell Seconds are the amount of time that a frequency persists before the program changes to the next frequency. The program will calculate and tell you how long it will take to output each step frequency once before repeating. If this time is longer than 2 hours, you will be prompted to Reduce the Frequency Range between the Lowest and Highest frequencies, or to Increase the Step Frequency, or to Reduce the Dwell Seconds, all of which will reduced the sweep time. When running Sweep, the changing Sweep frequencies can be monitored by pressing the 'OK' button. Press the 'OK' button again to switch back to the normal Run display. Note: Just because Frequencies are close in range DOES NOT mean they have the same purpose. An example would be 9.7 Hz for tendons. You don't want 9.6 or 9.8 because your results will be diminished. Another example, 1444Hz is to normalize testosterone in men and 1445 is to normalize testosterone in women. You certainly wouldn't want a male running this frequency and drift up towards 1445. It is important to keep this in mind when you are running sweeping so make sure you know the sweeping range is validated. The BCX Ultra now runs carrier wave from 1Hz to 4 MegaHZ. & up to 100,000Hz for the glass hand-held Ray Tubes. Carrier wave can be On or Off. 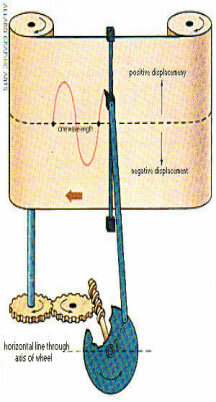 A Radio Carrier wave is a absolutely necessary in order to carrier the frequency deep in to the body. If a unit does not have a Radio Carrier wave then it is basically useless. Rife himself used a Radio Carrier wave. 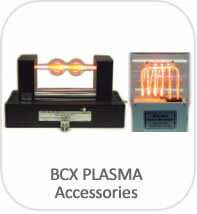 DISCLAIMER: The BCX Ultra Plasma Frequency Instrument is not approved by the F.D.A. as a Medical Device. They are experimental electronic instruments. They are not intended for the diagnosis, prevention, treatment, cure or mitigation of any disease in humans. They are not designed to affect the structure or function of any system in the body. If you have a health-related condition that requires medical attention, always consult with a licensed health care professional. NOTE: You should realize though, that you do have LEGAL Rights to self-medicate under the 9th Amendment of the United States Constitution. PRECAUTIONS: DO NOT use ANY Electrotherapy Device, if you have a Cardiac Pacemaker or Internal Defibrillator. DO NOT use ANY Electrotherapy Device, if you are a Pregnant, have Heart Disease, are driving or are using HAZARDOUS Machinery. These Devices should also be kept out of reach of Children. DO NOT place Electrode Pads over Skin Lesions, Abrasions, NEW Scars, Cuts, Eruptions, or Sunburn. DO NOT advance Output Amplitude to UNCOMFORTABLE Levels. DO NOT fall asleep, while using. * If you feel Sluggish, Faint, Dizzy, Headachy, Nauseous, or have Flu-like Symptoms after Exposures, REDUCE Number of Pulses per Session and/or SHORTEN Session Times. Use CAUTION, if you have IMPAIRED Kidney or Liver Function. Use CAUTION, if you have Metal Implant. Someone, although rare, may feel a sensation where the metal implant is located. However, they opt to run the freqs because the sensation is less bothersome than the problem. Systems Unlimited warrants your BCX Ultra to be free of defects in material and workmanship under normal use for three year from date of purchase, parts and labor included. Customer will be responsible for shipping fees incurred when mailing the instrument to the engineer for repairs. Systems Unlimited will be responsible for shipping fees incurred when mailing the instrument back to the customer while under warranty within the US. Any unauthorized repairs or modifications are not covered under this warranty. Contents of package upon arrival must be inspected upon receipt and report any broken glass tubes within the first 24 hours of delivery. Tubes with broken glass will not be covered by this warranty beyond the first 24 hours of delivery. 60-day money back guarantee less 10% restock fee if you are not completely satisfied with your purchase. No shipping charges reimbursed. 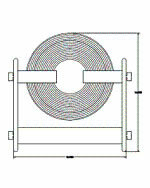 Our Vortex beam tube can be worn on the body or as a stand-alone beam tube. The main reason for the Vortex is for people who want a stand alone tube because Rife used one or hands free while working/ sleeping. The Vortex by no means takes the place of the hand held Ray Tubes that we are well known for. The hand-held Ray Tubes works differently, for more info refer to previous section on hand held ray tubes. For some time we had planned on doing what Rife did with the phanatron tube. His tube was in the 50 watt range and it was used for specific areas of the body. It would either touch the body or be held just off the body. The tube was used to pan the area of a tumor for an example: The ray tube was a partially directional transmitter. Vortex vs Phanatron Tube: The Vortex tube is directional to concentrate the energy more in one spot while the Phanatron Tube is more all directional. Benefits of the vortex tube for these 2 reasons:1) It is more for specific areas and not full body like the hand-held Ray Tubes and 2) your hand or arm can be put into the vortex tube. 1. Wavelength for colored LED's ranges from long (infrared), to short (ultraviolet). White is a mixture of colors centered around a middle (color temperature). 2. Luminous Intensity is the most accurate indicator of LIGHT INTENSITY. 3. Beam width and Focal plane define the distance from the light source where the light is most even. 4. Luminous flux takes into account the area over which the light at a given intensity is spread, and is the best representation of the QUANTITY OF LIGHT emitted. 5. Power in watts is a poor representation of the light output. It actually only shows the electrical consumption of the device. For example, a 100 watt incandescent light bulb puts out the same amount of light as a 20 watt Compact Fluorescent bulb (CFL). High Powered (HP) LEDs vs. Standard (Std) LEDs? The HP LEDs are so high powered that a fan is needed to cool it down. We are hearing that the LEDs are doing some wonderful things for tendon injuries and other deeper tissue injuries. 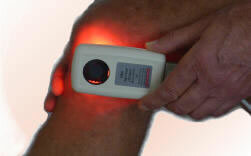 As with laser therapy the blue is used more for external problems such as infections on the skin. The blue will not penetrate very deep. The green is the highest powered and used for deep issues. The red will penetrate quite deep, but not as deep as the green. With deeper tissue issues most people will alternate between the red and green HP LEDs. We certainly are not claiming you will get the results as you would with a 10-20 thousand dollar laser. However, many issues will clear up just as well with our Std HP led. Do not stare at our HP LEDs. Only use our Std LEDs on the eye lids NEVER the HP LEDs. It is stated that you can remove an allergic reaction by placing the offending food on the naval (in a baggie if needed) and hold the LEDs, Std or HP over the food and move it close to the skin moving in a clock wise direction only. Slowly move out the circular motion to 6 or 12 inches in diameter for about 2 minutes. The green and red Std LEDs are applied alternately (green one day, red the next day, then green the following day, etc.). Hold the LED 1/4th inch away from an open eye, or directly on the lid of a closed eye. Start with 1 minute per frequency for each eye, working up to 5 minutes per frequency for each eye. This can be done twice a day. Red LEDs are applied directly in the navel to stimulate regeneration, for tonification and blood cleansing. GREEN LEDs are applied directly on the affected area of the skin for mutated cells and tumors. They can also be applied on acupuncture points. BLUE LEDs are used for SARS and Acne, Psoriasis (click for studies) and more. Apply directly on the affected area. All frequencies are applicable for use with LEDs. * This frequency is to be used 3 minutes in combination with 1 Hz. for 7 minutes, and 266 Hz. for 5 minutes. ** This frequency is to be used 3 minutes in combination with 1 Hz. for 7 minutes, and 123 Hz. for 5 minutes. "The first 3 times I used the mat, I could feel more energy going into my entire neck area where I have had stiffness and possible thyroid is sues. My blood test later showed the T3 and T4 count to be normal after years of low thyroid function. The second time, I could feel it in my sore left shoulder. It seemed that the energy was going to the area where my muscles have been in knots for a long time.... from lynda"
Pulsed Electromagnetic Field therapy (PEMFT), also known as PEMF, pulse magnetotherapy, and pulsed magnetic therapy. PEMFT is a therapy technique used in many ways, for example in depression and orthopedics treating fusions, fractures. When dealing with bone healing, PEMF sends magnetic pulses through the tissue where the magnetic pulses sends an electrical signal stimulating cellular repair. Multiple studies have shown how effective PEMF is in healing wounds, reduces inflammation, alleviates pain and many other conditions. Trials have been conducted by rheumatologists, hospitals, neurologists and physiotherapists. Made w copper coils. Copper has antimicrobial effect. "...that the antimicrobial effect of copper-alloy surfaces is a result of the metal stealing electrons from the bacteria when they come into contact with each other. "Once the bacteria donate the electrons to the copper metal, this places the organism into a state of electrical-charge deficit," she says. "As a consequence, free radicals are generated inside the cell, which ultimately leads to the cell’s death." - Frequencies: Modulated 10 to 6,000hz! 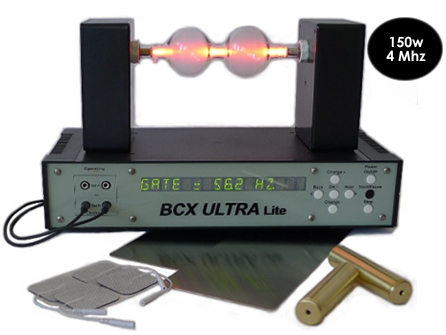 BCX Ultra Doug Coil is a electromagnetic field generator. The most important factor in the BCX UItra Doug Coil is that we use state of the art 21'st century technology. We do not use banks of switches and lookup tables, no awkward maneuvering of the knob until a meter reads something, & no wires all over the place. The microprocessors in BCX Ultra Doug Coil automates the entire operation. Simple to use. You simply just run a prestored or custom program with all of our variable parameters. And, it is substantially lighter and smaller, and is actually portable. Doesn't need a furniture dolly or hand truck, it's not made of plywood, and it doesn't have wheels! The front of our unit is 17" x 5-1/4" (depth 13"). • Coil Design: The BCX Ultra Doug Coil has a unique coil that operates at both low and high frequencies. Other Doug Coil machines require different coils to operate at low and high frequencies. 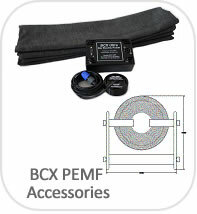 • Frequency Range: The BCX Ultra Doug Coil has a unique design which operates from 10Hz to 6,000 Hz. Other Doug Coil machines have a limited operating frequency range. • Cooling Design: The BCX Ultra Doug Coil has a unique construction which substantially reduces heat. Other Doug Coil machines coils get hot after a short period of time. - Frequencies: 1Hz to 4,000,000hz! 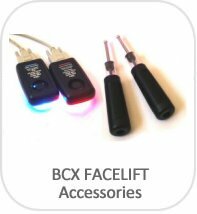 BCX Ultra Facelift Accessories delivers professional results for facial toning and skin rejuvenation incorporating a revolutionary proprietary 3 level treatment that includes the use of microcurrent, LED’s and frequencies. 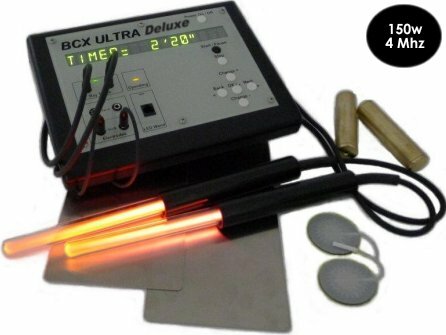 The BCX Ultra facial accessories then increases the skin rejuvenating effects from the first level of treatment of microcurrents by combining it with high powered LED’s. The healing benefits of the LED (light emitting diodes) have been proven to penetrate ~ one inch into soft tissue and can even move through the meridians. The compact and light weight high powered LED’s, emit infrared light which is great for increases cellular metabolism, accelerating healing. The flagship of our unique, innovative technology is the third level of the non-surgical facelift treatment which is the application of almost limitless, programmable frequencies that run through our unique BCX facelift accessories, the hand-held microcurrent electrodes & the high powered LED’s. No other device on the market incorporates this technology. 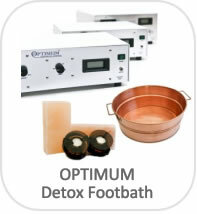 Frequencies that have been proven to be succesful for a myriad of disorders or issues are incorporated in this treatment. The benefits of these frequencies have been proven efficacious and are perfectly safe for thousands of disorders. 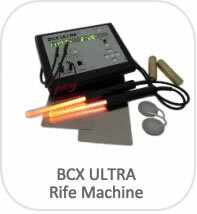 Unlike any other device on the market, the BCX Ultra rife frequency machine is world renowned for its capabilities in frequency output range (1Hz to 4 MHz. ), frequency accuracy, and power. Superior results require superior technology. Only the BCX Ultra delivers unparalleled quality for non-invasive cosmetic facial rejuvenation & toning. 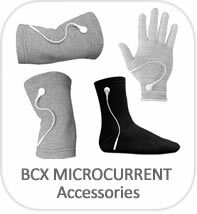 BCX Ultra Microcurrent Accessories delivers microcurrent therapy. Your body's different tissue type have their own signature electrical frequencies, which can be disrupted by diseases or infujuries. Microcurrent therapy restores the cells' frequencies, resulting in improvements in inflammation, pain and healing. Microcurrent therapy increases in the cells' ATP, which is the energy that fuels all biochemical functions in the human body. Microcurrent therapy can also increase protein synthesis, which is needed for tissue repair. 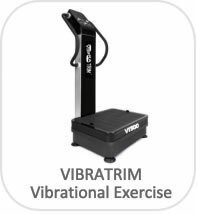 Increase in blood flow and decrease in inflammation then reduces pain and spasms, as well as increased range of motion and functionality. 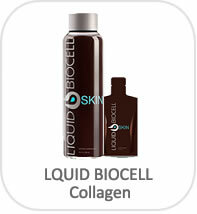 promotes growth of new healthy cells and stimulates the immune system. It also can promote DNA synthesis activation of T-Lymphocytes, Insulin Binding, Calcium Channel Opening, and Fibroblastic Activation. - Frequencies: 1hz to 10,000hz! FAR Infrared Heat therapy (FIR), Pure Far-infrared by Active Carbon Fibers™ delivers ultimate soothing warmth throughout your entire body. Each carbon fiber emits bio-genetic waves of far-infrared across most of the internal arch surface of the dome as it gets excited with an electric current. It feels soft, relaxing, pleasant, and refreshing, which you might not have experienced from any other heat source yet. WHAT IS FAR INFRARED (FIR) It is a specific wave length of light from the sun. Among the rays coming from the sun, the FIR waves are the safest and the most beneficial. What exactly is radiant heat? No need to worry - it has nothing to do with either ultraviolet radiation (which gives you a sunburn and damages your skin) or atomic radiation (the kind from a nuclear bomb). Radiant heat is simply a form of energy that heats objects directly through a process called conversion, without having to heat the air in between. Radiant heat is also called infrared energy (IR). The infrared segment of the electromagnetic spectrum is divided into three segments by wave length, measured in microns or micrometers (a micron = 1/1,000,000 meter); .076-1.5 microns = near or close; 1.5-5.6 = middle or intermediate; 5.6-1000 = far or long-wave infrared. The infrared segment of the electromagnetic spectrum occurs just below or "infra" to red light as the next lowest energy band of light. This band of light is not visible to human eyes but can be seen by special cameras that translate infrared into colors visible to our eyes. We can, however, feel this type of light which we perceive as heat. Our sun produces most of its energy output in the infrared segment of the spectrum. Our atmosphere has a "window" in it that allows FIR rays in the 7-14 micron range to safely reach the earth's surface. When warmed, the earth radiates infrared rays in the 7-14 micron band with its peak output at 10 microns. Why is this Infrared system unique? It uses infrared radiant energy to directly penetrate the body's tissues to a depth of over 1-1/2". Its energy output is tuned to correspond so closely to the body's own radiant energy that our bodies absorb close to 93% of the infrared waves that reach our skin. 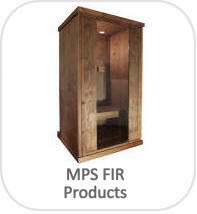 One of the reasons FIR has beneficial results in a variety of illnesses is the ability of FIR waves to remove toxins, which are often at the core of many health problems. Numerous toxins are stored in our bodies. Toxic gases may be encapsulated by clusters of water. Where these toxins are accumulated, blood circulation is blocked and cellular energy is impaired. When a 10 micron FIR wave is applied to these large water molecules, the water begins to vibrate, which reduces the ion bonds of the atoms which are holding together the molecules of water. As the breakdown of the water molecules occurs, encapsulated gases and other toxic materials are released. • Elevates the temperature of subcutaneous layers, thus expanding blood capillaries, stimulating blood circulation, increasing metabolism between blood and tissue, promoting tissue regeneration and reducing cramping. • Penetrates 4-5 centimeters into the dermis (middle layer of skin) from muscles into blood vessels, lymphatic glands and nerves. • Affects every living cell and produces warmth. Through this cell tissue" micro-friction" and the vibration of molecular resonance, chemicals within cells are activated. • The warming effect is helpful in eliminating such things as the waste products generated by aging, heavy metals and toxic substances, which are then secreted by the sweat and dermis-layer fat glands. 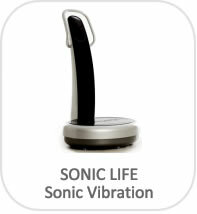 • Adjusts the autonomic nerve function and reduces the over-stimulation of sensory nerves. • Dramatically increases healing and regeneration. 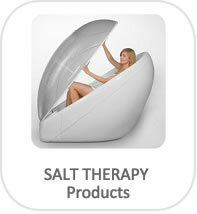 Treatments generally last 20 minutes to an hour, but it does not hurt to use it longer. Initially, relief is only temporary, but with repeated treatments the duration of relief becomes longer and eventually becomes lasting. The BCX Ultra uses different electronic circuits to generate frequencies between 1Hz to 100kHz and between 100Khz to 4Mhz. 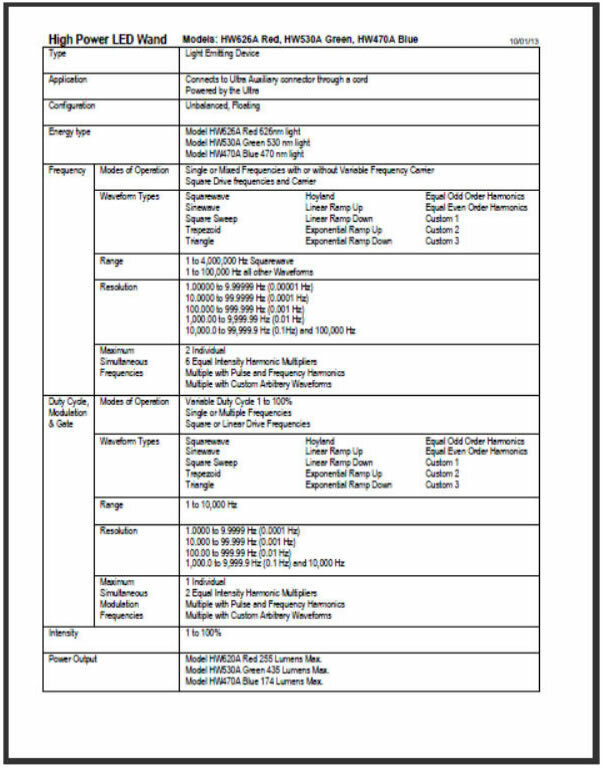 The different electronic circuits have different resolution characteristics. Resolution is the smallest step between numbers- in this case, frequency. DO Not confuse the resolution w the preciseness of the frequency or carrier output. We have the highest preciseness frequency/carrier output due to our electronics. For example with the BCX Ultra for frequencies from 10,000 hz 100,000hz is a resolution of .1 , if you put in 10,000, you get out 10,000. If you put in 10,000.1, you get out 10,000.1. You cannot put in 10,000.050 and get out 10,000.050, because that would require resolution of .05. With the BCX Ultra for frequencies/carrier above 100,000hz is a resolution of 100 , if you put in 200,000, you get out 200,000. If you put in 200,100, you get out 200,100. You cannot put in 200,050 and get out 200,050, because that would require resolution of 50. If you put in 200,000 and get out 200,100, you have frequency error. This is sometimes referred to as "frequency accuracy". Assuming no bad electronic components or problems in software, this gets down the accuracy of the quartz crystal oscillator used in modern electronics, and it is available in various accuracies. The one used in the BCX Ultra is 5ppm (parts per million) initial and at room temperature. That means if you put in 200,000, you will get out a frequency between 199,999.95 and 200,000.05 Hz. We do not consider accuracy over temperature, which can change significantly, because this equipment is not used in a vacuum in outer space, or to measure the temperature of the lava in volcanoes. 1. WHAT FREQUENCY RANGE IS NEEDED? up to 4Mhz carrier wave & frequency is plenty high enough to run Rife's Original frequencies. Most frequencies used today are below 100,000 hz. 2. WHY SHOULD I GET THE POWERFUL BCX ULTRA BEAM TUBE? 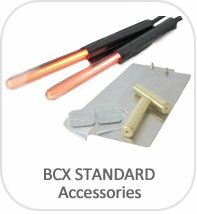 The BCX Ultra has a wide range of Core & Optional Accessories. Our clients have had great success w the Hand-held Plasma Ray Tubes & metal accessories. However w the stand alone BCX Ultra Beam Tubes (double-bubble tube) you can do hands free treatment while you are sleeping, more than one person or even combine up to 2 electrodes along w the Beam tube amplifying your results. 4. DO I NEED TO BUY A NEW BCX UNIT IF THERE SW OR HW UPGRADES? Any Software Upgrades, just send in your unit to get the latest and greatest. Future option will be through your computer. For hardware upgrades in most cases your unit for a nominal fee can be upgraded, contact us and we can give you an estimate. 6. DO I NEED ADDITIONAL EQUIPMENT FOR THE BCX ULTRA? No, both Amplifier and Frequency Generator are both built-in to our BCX Ultra unit (other units are separate) AND (4) Apparatuses are included (proprietary Hand Held RayTubes, metal footplates, metal hand-held cylinders, and pre-gel pads) other units have no included apparatuses or they only have metal cylinders. We do have additional apparatuses but not required and are optional. 7. WHAT HAPPENS IF THE PRE-STORED PROGRAMS DOES NOT HAVE FREQUENCIES THAT I WOULD LIKE TO RUN? We have 256 slots (custom programs) to save your own frequencies and for each slot you can save up to 48 frequencies making a total of 12,288 frequencies. You can also combine Pre-Stored programs and save them to your own custom program. 8. CAN I CHANGE THE SETTINGS OF A PRE-STORED PROGRAM? When you run a pre-stored program you have the ability to make any modifications you would like Or just run as is. 9. CAN I SWEEP A RANGE OF FREQUENCIES? Yes it is a 'nice to have' functionality since it can run through a range of frequencies without having to store each individual frequency and with the BCX Ultra you can also try sweeping thru a range of carrier waves. However please note that you must be sure that the range you are running is valid so use this functionality wisely. Just because Frequencies are close in range DOES NOT mean they have the same purpose. An example would be 9.7 Hz for tendons. You don’t want 9.6 or 9.8 because your results will be diminished. Another example, 1444Hz is to normalize testosterone in men and 1445 is to normalize testosterone in women. You certainly wouldn’t want a male using the machine and have the frequency drift up towards 1445. It is important to keep this in mind when you are running sweeping. With a sweep you can be doing the wrong frequency the majority of the time except for that brief moment when you brush over the correct freq. With our machine you are doing a sweep in which you can select how long to dwell on a frequency instead of only a few seconds. When you briefly play a frequency for a few seconds you bruise it slightly. Where as seen on Royal Rife's videos blowing up microorganisms, the microorganism struggles for many seconds or minutes before it blows up. Rife and the early geniuses who worked with Rife new that you needed to strongly hit an organism long enough so that it would build up a big enough resonate charge to blow it up. Again, a few seconds will only tease it. We do include Pre-stored programs that do a wide sweep of basic microbial clean-up. 10. HOW FAR REALLY CAN A BEAM TUBE RADIATE OUT? In other words, you have 1% of the power at 10 feet away that you have from 1 foot away. Even at 1,000 ft and more there is still some power, although very small. Without knowing what the desired power level is, you can't specify an "Output Range". If you are interested in maximum power, you want the shortest distance possible period . 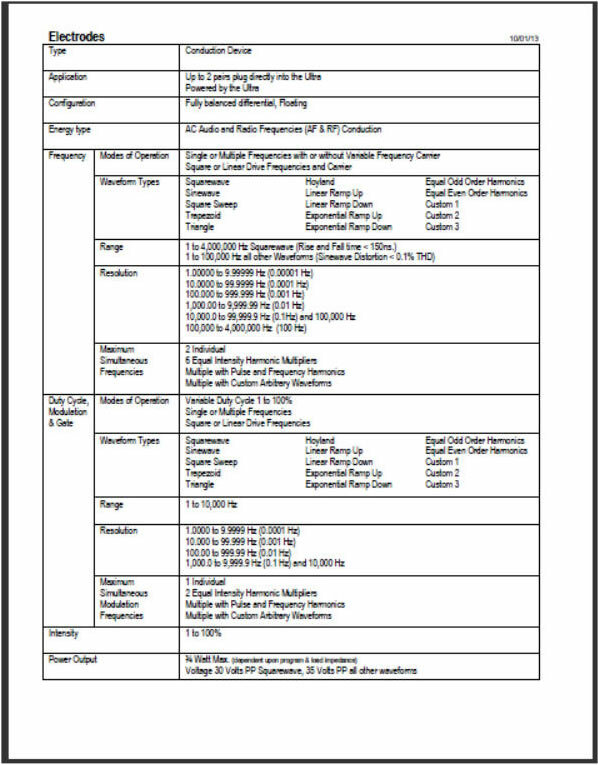 Some unit manufacturers will specify output ranges effective ie 30 feet out (more or less). As you can see power is not effective this far out but the frequency signal can be picked up. If you don't have the power then the frequency isn't effective. click for more information from our Engineer . 11. WHY IS THE BCX OUTPUT POWER RATING HIGHER THAN THE POWER SUPPLY POWER? The BCX Ultra does not merely output a frequency- that is not what Rife machines do. Real Rife machines "Modulate" the frequency. This turns the frequency on and off at a programmed rate with designated waveforms. Thus the average power drawn from the power supply is less than the maximum power that the BCX Ultra delivers. 12. DO YOU WANT TO RUN MULTIPLE FREQUENCIES? Those who run multiple frequencies simultaneously are seeking the benefits of the time savings to use multiple frequencies. BCX Ultra manufacturer decided to cap at 3 simultaneous frequencies (frequency, carrier wave, and gating) due to the more frequencies ran the more the wattage/power is divided up thereby decreasing the power delivered per frequency. In turn then the user has to repeat the frequencies to get the needed dose. 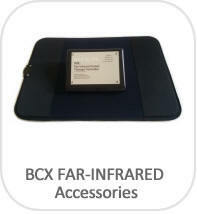 The BCX Ultra can run up to 3 frequencies (frequency wave, carrier wave and gating). Other manufacturers state differently. We believe running 1 carrier wave and 1 frequency with the most power output for that accessory is the best method for treatment. Having 1 carrier wave carrying multiple frequencies is not as effective. Now they state that if there is enough power delivered then each frequency will be effective and all is needed is .20 watts per frequency. 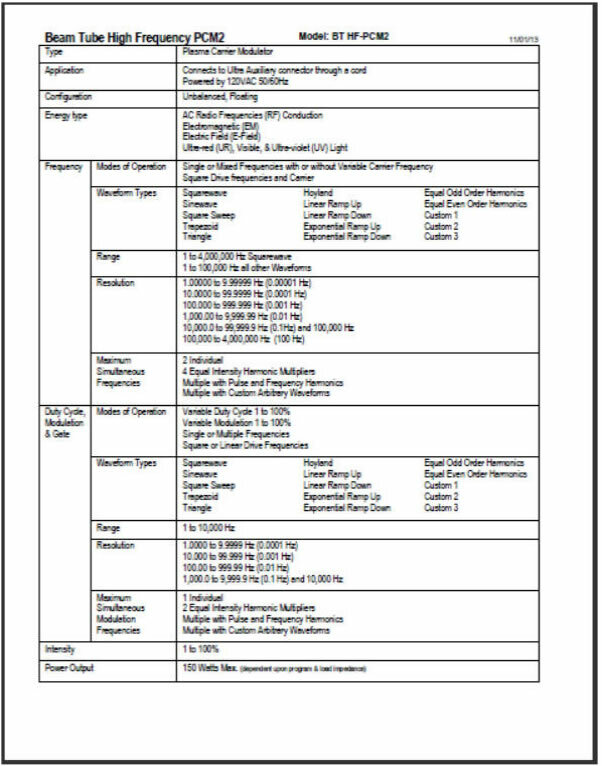 However we limit our metal electrode power output to .75 watts (w 30-35 volts) to stay within safe limits since electricity is the means of delivery thru metal electrodes (this doesn’t apply to the plasma accessories). Most of our clients can’t handle the full .75 watts (then turn down the power) so we wonder how can someone handle the full power of 2.7watts? Keep in mind our BCX Ultra has a built in 18 watt amplifier so we easily can produce the power. 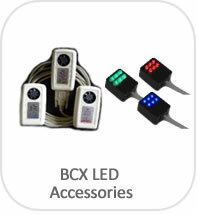 Note our BCX Ultra unit has different accessories that add additional power to go from 20watts all the way up to 150 watts depending on the accessory. Refer this link for the test data proving this click for Test Data..
Square wave is for killing pathogens and sine wave is used for regeneration and healing. The BCX Ultra has many other waveforms to choose from for your experimentation. At this time we use the sq. pulse width as the default because we are getting better results with this modified square wave than standard square wave. Many of our clients have reported this. The BCX Ultra has a carrier frequency wave so that the audio frequency can piggyback (carried) by the RF frequency (the carrier) causing the frequencies to penetrate deeper and farther. RF or radio frequencies above about 200,000 Hertz broadcast very well which is why they are called radio frequencies. Frequencies between 20,000 and 200,000 Hz broadcast to some degree, while frequencies below 20,000 Hz do not broadcast at all. Both the BCX Ultra RF carrier and audio frequency can be set anywhere from 1hz to 4Mhz.There are prestored programs with audio frequencies and carrier wave already set however carrier wave and other settings can be changed if so desired. The BCX Ultra gives you the ability to research and do your own testing. This is what we used to call pulse. The previous unit had a pulse rate of about 2/3’s on and 1/3 off. You can use 3.5 Hz to get this same effect. We now use 56.2 Hz as the default in the BCX Ultra. Abrams who worked with Rife used 3.5-4 Hz for gating. Dr. James Bare, a leader in the field of frequency technology, recommends the 20-30-40 Hz range for gating. It is generally believed that the higher the frequency the higher the gating. Rife’s 1939 instrument, which ran in the MHz range, had a 60 cycle gating. What is gating? Gating is another form of modulation. The BCX Ultra is modulating 2 frequencies when it plays an audio frequency with a carrier (RF) frequency. In other words, the audio frequency is piggy backed onto a higher frequency. All the time this is happening, the Ultra introduces gating which creates the blink, blink you see as you play your frequencies. Entrainment is defined as: "the tendency for two oscillating bodies to lock into phase so that they vibrate in harmony. It is also defined as a synchronization of two or more rhythmic cycles." This principle of entrainment is universal in nature. 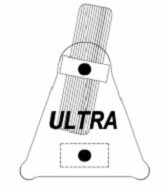 The Ultra has a default of 90 percent duty cycle. For many years people ran the standard 50% duty cycle. It is now known that a 90 % duty cycle exposes microorganisms to the frequency for 80% more time than a 50% duty cycle. Do the math. 90% is 80% greater than 50%. It is known that the higher the duty cycle, the greater the coordinative resonance. However, experimenters may choose any duty cycle 1-100 using the Ultra. What is duty cycle? Duty cycle is how long the frequency is on and off when running a frequency. For example, if running the frequency 100Hz, the frequency is cycling 100 times per second. A 50% duty cycle means that the frequency is on 50 % and off 50% of each second. The 90 % duty cycle means that the frequency is on 90% and off 10% of each second. During the 90% on, it is cycling at the rate of 100 times a second. GLASS HAND-HELD RAY TUBES and FOOT PLATES: Generally the glass tubes are used simultaneously with the footplates. This gives more frequency power into the body. Some people prefer to use the glass tubes alone. "Frequency" is the # of times in a second an electrical pulse occurs, defined in Hertz (Hz). 10 Hz means that a signal changes polarity or pulses 10 times per second. Kilo (abbreviated K) means 1,000 (thousand), Mega (abbreviated M) means 1,000,000 (million), and Giga (abbreviated G) means 1,000,000,000 (billion). 10 KHz is the same as 10,000 Hz. 10 MHz is the same as 10,000,000 Hz. Frequencies that can be heard are called Audio frequencies (abbreviated AF), and the rest of the frequencies (which are easily transmitted through the air) are commonly called Radio frequencies (abbreviated RF). (Although Audio frequencies are technically Radio frequencies as well) The dividing line between Audio and Radio frequencies is not consistent, varying with different people and industries. Frequencies below 100,000 Hz are audible to some animals and will not produce significant side effect frequencies that can be easily transmitted through the air. 100,000 Hz. is one appropriate dividing line between Audio and Radio frequencies. Electrical signals act differently at different frequencies. A characteristic called “skin effect” (which is not confined to skin) causes a conductor to resist the flow of electricity as a function of frequency- the higher the frequency, the greater the resistance to the flow of electricity. At low frequencies, say 60 Hz (household electricity), a sufficiently high voltage has the ability to penetrate through the body and create cardiac arrest. 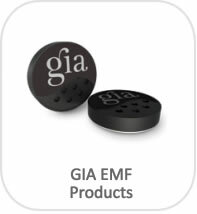 At high frequencies, say 1 GHz (low frequency radar), the same amplitude voltage can only penetrate a fraction of an inch into a body, and will only create a surface skin burn called a RF burn. "Waveforms" are patterns of electrical energy over a period of time. A Sinewave is the fundamental building block of electricity and other energies. Sinewave mathematically defines a natural action describing a harmonic alternating event. Mapping the elevation of a point on the perimeter of a circle as it constantly turns can show a Sinewave. On this picture, note that the arm is attached to the perimeter of a wheel. As the wheel is turned, the arm moves up and down, and a pen draws a Sinewave on paper that moves left to right. A Sinewave travels above and below a middle, or mid-point, (+ and -), like waves advance and recede from an average position on the shoreline. They obviously look different than Sinewaves, but they are closely related. Adding together Sinewaves of different frequencies, amplitudes, and phases creates Triangle, Square, and all other waveforms. The mathematics is straight forward. 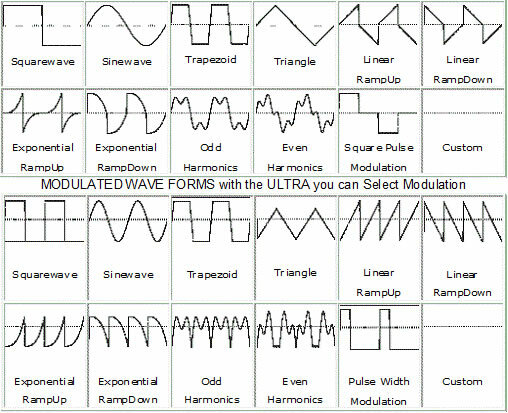 "Harmonics" is the combination of all the different frequency Sinewaves making up a complex waveform, for example Triangle wave, Square wave, and all other waves. 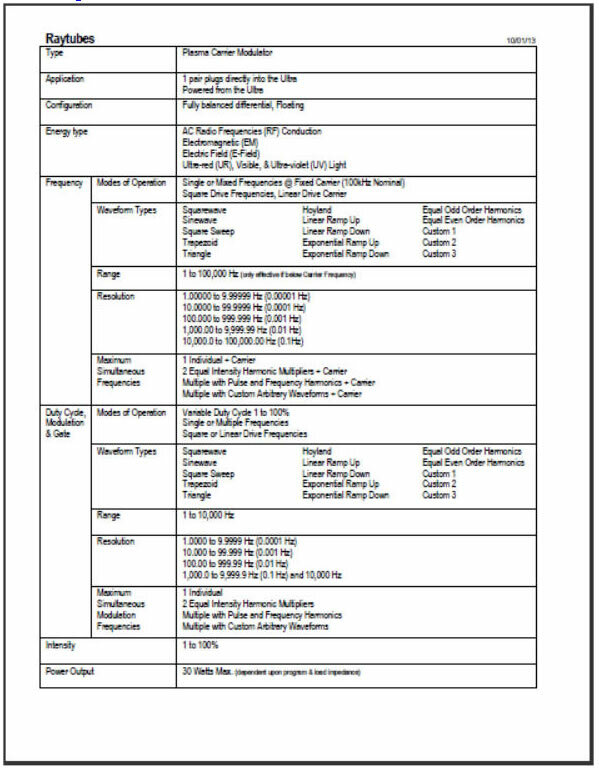 Below lists the "Harmonic Content" of the BCX Ultra waveforms power generated. Referring to the above chart, 1’st (x1) Harmonic is the 'actual' frequency, 2’nd (X2) Harmonic is another frequency 2 x as large as the 'actual' frequency, and 3’rd (x3) Harmonic is another frequency 3 x as large as the 'actual' frequency, and continues on. For Example: An Actual Frequency of 10 Hz, then a 2’nd Harmonic = 20 Hz; and the 3’rd Harmonic = 30 Hz. 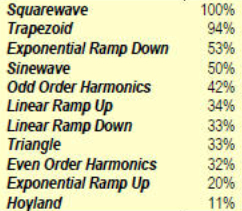 For Example: A Triangle waveform @ 100Hz is generated by combining 99% of a 100Hz Sinewave w 1% of a 300Hz Sinewave. Phase is the relationship of each Harmonic starting point within a period of time. Phases with different starting points will form different waveforms, however it will not change the ratios of power for each Harmonic delivered. Various Waveforms are generated with uniform Peak to Peak (the lowest point to highest point) values. However, Peak to Peak values that are equal doesn't mean the same power is delivered and can deliver different power amounts. A Squarewave delivers 3 x more power than a Triangle Wave when at equal intensities. A Squarewave (intensity setting at 33%) will deliver the same power amount as a Triangle wave with 100% intensity. The Table lists the power of the various waveforms. The BCX Ultra is able to produce three concurrent 'Arbitrary' waveforms generated by a computer so they are not limited to electronic signals, for example the Sine wave & Squarewave. The BCX ultra can produce endless combinations of Harmonics (w any phase & ratio) since the BCX Ultra waveforms are arbitrary. 1. "Gate or Pulse" is the 1st BCX Ultra waveform. Gating or Pulsing are the commonly known terms, however since the BCX Ultra has much greater capability of Gating/Pulsing, a better term would be "Modulate". Modulating is where the waveform is increased and decreased by the power output intensity. Most rife devices (if they even have Gating/Pulsing) are not able to do this. They can only turn the signal on & off. Inorder for a Gate/Pulse waveform to properly pass the harmonics of the Output frequency wave, the Gate/Pulse frequency wave must be lower than the other waveform frequencies. 2. "Duty Cycle" will insert an Off time in between each Modulated waveform and will correspondingly alter the frequency of the waveform. Selecting a Duty Cycle of 100% prevents any Modulation of the output, leaving it on full the entire time. Example: A frequency of 1 Hz. is selected, which is 1 change per second. A duty cycle of 50% is selected. One complete waveform will take place in ½ second, after which the output will be blanked for ½ second. The process will then repeat. 3. "Carrier" is the term for the second Ultra waveform, and following conventional electronics, it "carries" a lower frequency within it. As such, in order to work properly, a Carrier frequency should be higher than the remaining waveform frequency. 4. "Frequency" is the term for the last Ultra waveform and is "carried" by the Carrier. Sequences are generally composed of a program of "Frequencies" one after another, each with the same "Gate" or "Pulse", and "Carrier" (which is optional). 5. "Pulsewidth": In addition to the waveforms described, there is an additional Arbitrary waveform that operates differently. It is called "Pulsewidth". Pulsewidth varies the On to Off ratio in a sweeping pattern as the program runs. Example: A frequency of 1 Hz is selected, which is 1 change each second. The Output is turned on for 1/100’th of a second, and then turned off for 99/100’ths of a second. Next, it is turned on for 2/100’ths of a second, and then off for 98/100’ths of a second. This continues until it is on 99/100’ths of a second, after which the sweep starts again. Electrodes are "differential". Each operates at a different polarity than the other, and they change polarities with frequency- when one is +, the other is -. All 3 waveforms can be applied to Electrodes. Raytubes also have polarity, but the Carrier is capped at 100,000 MHz. LED Wand has no polarity, and all 3 waveforms can be applied to it.